Set in a prime location of San Cristobal De Las Casas, Casa María Angelina puts everything the city has to offer just outside your doorstep. Offering a variety of facilities and services, the property provides all you need for a good night's sleep. Service-minded staff will welcome and guide you at Casa María Angelina. Guestrooms are designed to provide an optimal level of comfort with welcoming decor and some offering convenient amenities like flat screen television, television, satellite/cable TV, toiletries, shower. The property offers various recreational opportunities. 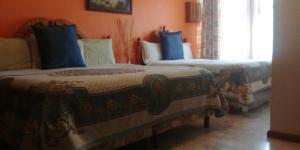 Convenience and comfort make Casa María Angelina the perfect choice for your stay in San Cristobal De Las Casas.